In 10-inch skillet, cook sausage and onion over medium heat 8 to 10 minutes, stirring occasionally, until sausage is no longer pink then stir in tomato sauce, basil, half of the parsley, marjoram, sugar and a pinch of salt. Simmer sauce for 30-40 minutes until the tomatoes are reduced down and flavors are combined. In medium bowl, mix ricotta cheese, Parmesan cheese and oregano and the rest of the parsley. Heat oven to 350°F and cook noodles according to package. When noodles are done, drain them and put them in ice water to keep them from sticking together. In an ungreased lasagna pan or 13x9 baking dish, spread half of the sausage/sauce mixture in the bottom of the pan. Add a layer of noodles followed by half of the ricotta mixture. Sprinkle on half of the grated mozzarella cheese. Add another layer of noodles, the rest of your sausage sauce, and the last half of your ricotta mixture. Add a final layer of noodles and the final 1/2 of your mozzarella cheese. Sprinkle on some grated Parmesan on top of the lasagna, cover with foil, and bake for 30 minutes. Uncover the dish and bake it for another 20 minutes. Let cool briefly before serving! 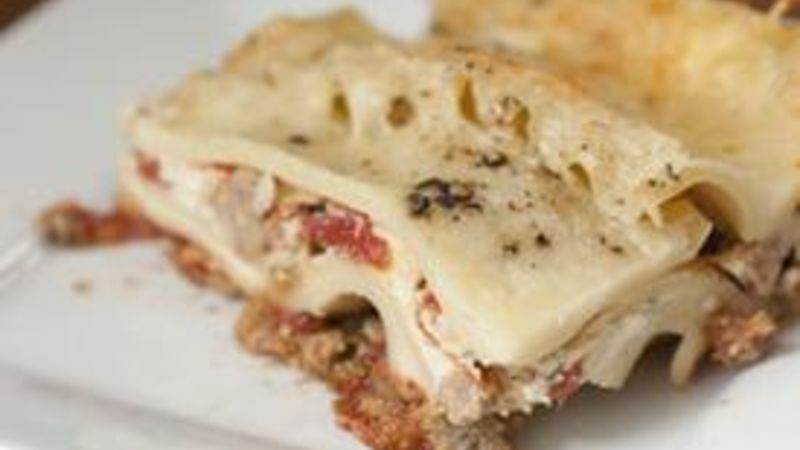 Today's twist: Fire Roasted Italian Sausage Lasagna, Macheesmo's version of Betty's classic Italian Sausage Lasagna. As a kid, what I knew as lasagna was exactly the Betty Crocker lasagna recipe. I didn’t even realize there were other ways to make it. To me, the keys to good lasagna were always locked away in that bright red cookbook. It wasn’t until after college that I started fiddling with the recipe. Of course, the first few times I tried, I felt almost dirty for messing with such a classic recipe. Eventually though, I learned that there were some subtle things you can switch out that can give the original recipe some really nice changes. For this fire roasted lasagna recipe, I used Muir Glen fire roasted tomatoes for the sauce which gives it an almost smoky, deep flavor. I also increased some of the fresh herbs, added some marjoram which I love in lasagnas, and added more cheese! The original is good. But so is change. The first thing you’re going to want to get started is the sauce because it needs to simmer for about 45 minutes. Start by chopping up half an onion. As a refresher, the easiest way to slice up an onion is to cut it in half vertically (so you cut through the root tip), then put the flat part of the onion on a cutting board and slice a grid: vertical and horizontal slices. Then you can just slice downward to dice the onion in no time. This is far and away the most efficient way to chop an onion. In a large skillet, add your sausage over medium-high heat. Cook it for 8-10 minutes until it’s browned nicely. Then add in your onion and garlic and continue to cook until the veggies are soft. Next, add your tomato sauce, sugar, a pinch of salt, and all the herbs. Lots of fresh herbs are never a bad idea when you’re making Italian food! Stir this all together and bring it to a simmer. Let the sauce simmer away for 30-40 minutes over medium heat. Your finished sauce should be nice and thick and speckled with lots of herbs. While your sauce cooks, you can prep the other things for the recipe. In a small bowl, stir together the ricotta cheese, ½ of the fresh parsley, the oregano, and ½ of the Parmesan cheese. For the noodles, you can use any lasagna noodle. They make whole wheat lasagna noodles these days that are actually very good. I just used regular noodles on this day though! Cook the noodles in salted water according to the package. They will probably need to boil for 12-14 minutes. When they are done, drain and immediately add them to a large bowl of ice water. This will stop the noodles from cooking and also prevent them from sticking to each other. Now you’re ready to make some lasagna! In your lasagna pan, add half of your sausage sauce to the bottom of the pan as a base. Then add a layer of noodles, followed by half of your ricotta cheese mixture and half of the grated mozzarella cheese. Add another layer of noodles followed by the rest of the meat sauce. Add the last of the ricotta mixture to the top of the meat sauce. Cover that layer with one final layer of noodles and top the dish with the rest of the grated mozzarella cheese and Parmesan cheese. I also sprinkled on some crushed black pepper. Cover the lasagna with foil and bake it at 350 degrees for 30 minutes. Then remove the foil and bake it for another 20 minutes. The finished lasagna will be a thing of beauty! Of course, the nice thing about lasagna is the quantity. Even a family of four could get two meals out of this – probably with some leftovers. Nick ate lasagna for days after making this. He has a very hard life. Be sure to check out his blog, Macheesmo, and follow him from his Tablespoon profile.